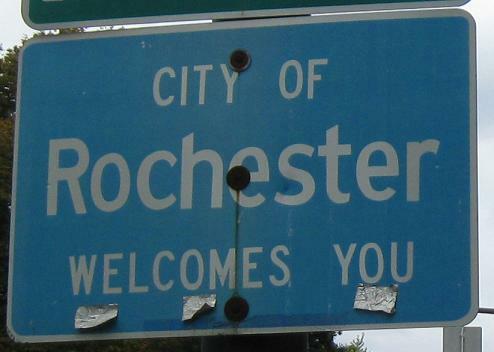 All photos except the first one below are in or near Rochester, which has plenty to go around. 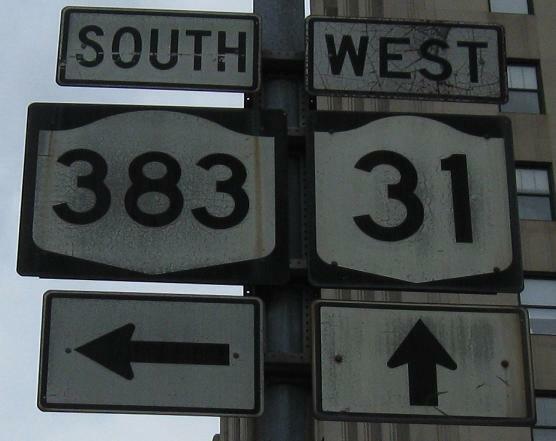 The one above, which manages to be both old and wrong (the hump is too wide), is on Winton Rd. SB at the edge of Brighton. That's the way to say it! Sadly, you won't find shields like these around anymore. This is from Mike Traverse's personal collection. 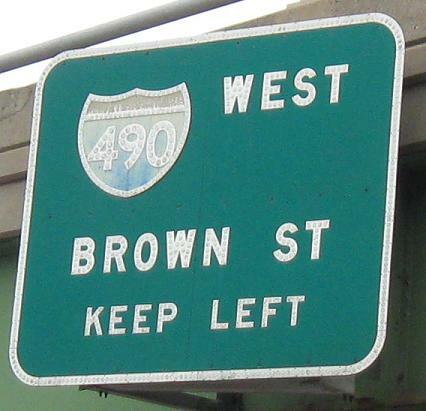 Broad St. WB approaching Brown and Campbell Streets by I-490 Exit 12. 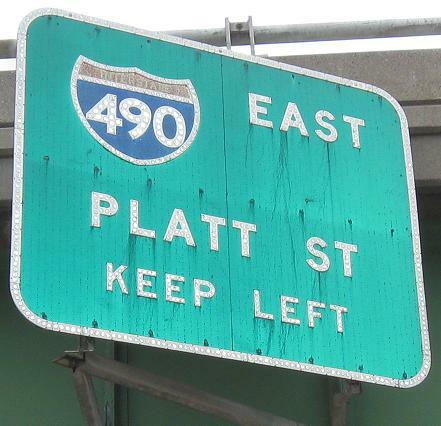 The reconstruction of the freeway through Rochester closed the WB onramp from Campbell St.
EB in the same spot; the onramp from Platt St. EB is also closed. 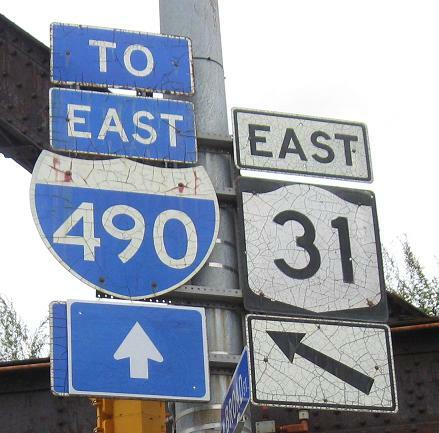 The straight arrow looks like it's pointing a different way than the slanted left arrow, so NYSDOT should have matched them. 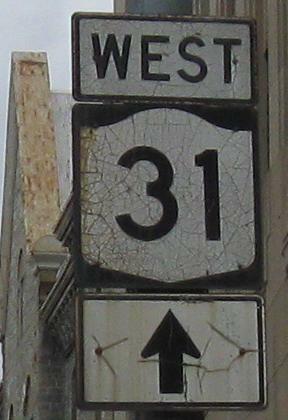 Allen St. EB, which becomes Platt St. here at Broad St. (NY 31). 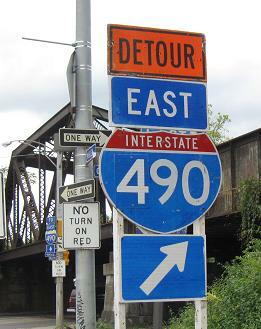 It's disappointing to see a reused I-390 bubble shield so close to a genuine I-490 shield - why couldn't NYSDOT have patched this arrow as well and just left the old shield? Click on the second photo for closeup. 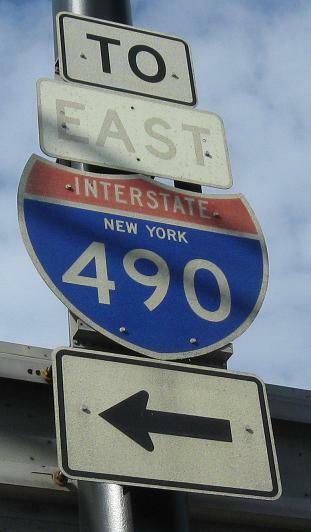 WB at the beginning of NY 33 underneath I-490 just east of Exit 13. The two BGS's are on opposite sides of the road - I would rather separate them into two photos than shrink them down to fit in one. 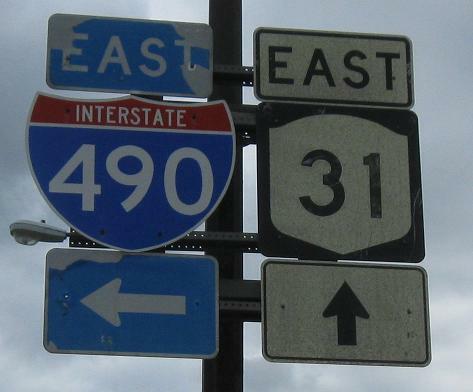 The two assemblies are on opposite corners of the intersection - the second one is the far left corner if facing WB. 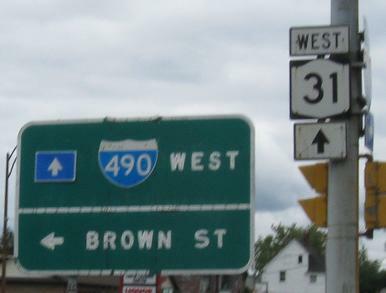 Broad Street is NY 31, so the lack of mention on the BGS is odd. 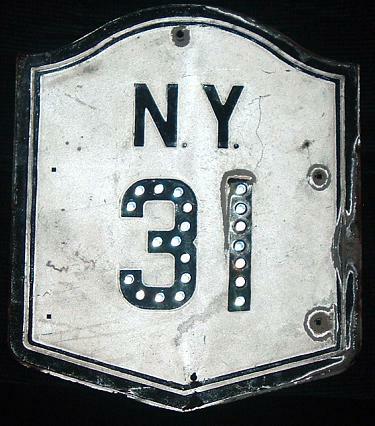 If you can see below the NY 31 shield, how do you think the Erie Canal Industrial Park is doing nowadays? Boys Club Pl. NB at the same intersection. Another failure to put the route on the BGS. 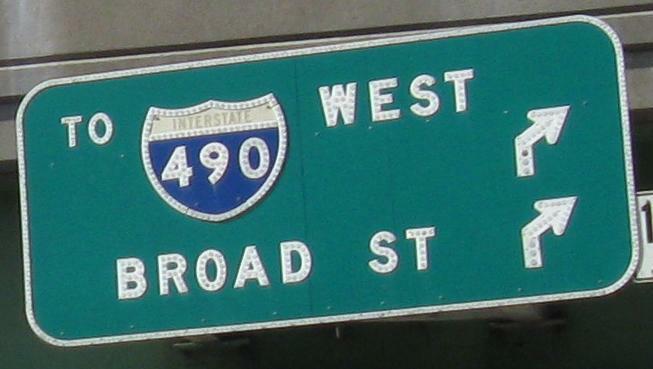 Same place, other direction (Broad St. WB at Main). 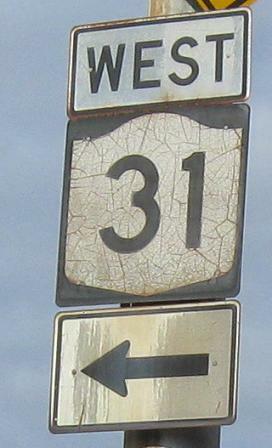 WB on the west side of the Genesee River. 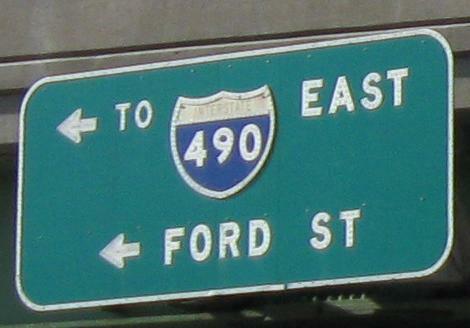 EB starting at Fitzhugh St., then crossing the Broad St. Bridge to South Ave. 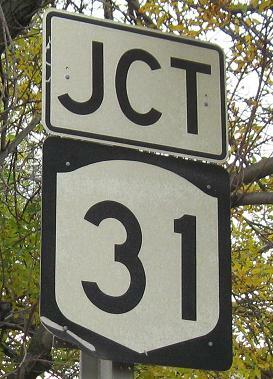 The JCT sign for NY 383 said either ALL TRAFFIC or THRU TRAFFIC, but oddly only the TRAFFIC part is still visible. 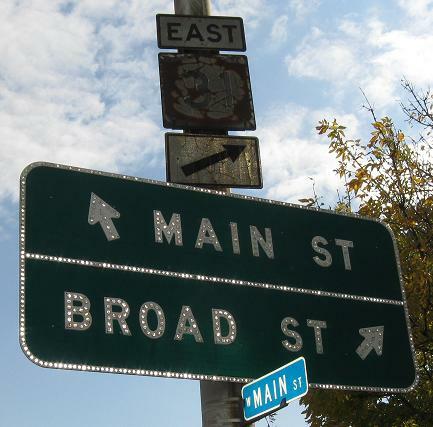 The Broad St. Bridge, seen here from Main St. (facing south/upstream) and then from Court St. (facing north/downstream), began life as an Erie Canal aqueduct in 1842. 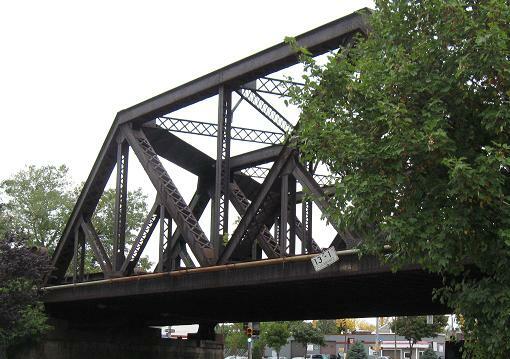 At the turn of the century the Canal was rerouted and the Rochester subway line was constructed on its former course. 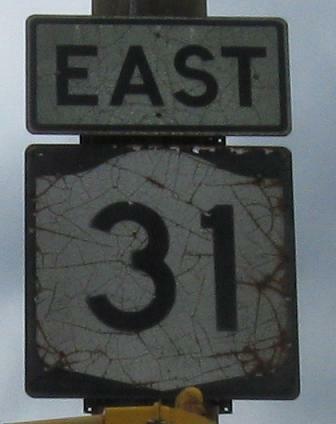 Broad St., here NY 31, was laid on top of the subway. Somehow the aqueduct crossing of the Genesee River happened to perfectly suit these layered uses - I believe from historical photos that the walls of the aqueduct started on top of the first set of arches, and were reconstructed into the second set of arches to allow light into the subway level. Then the supporting columns and top deck were added at that point. 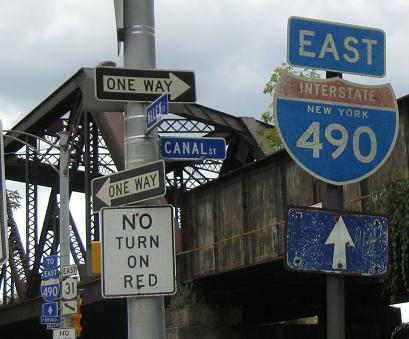 The Rochester subway died in the 1950's, and the abandoned tunnels are still mostly walkable but also provide safe haven to the homeless, which means anyone can access them with any sort of intent (parts of the tunnels are pitch-black), so be very cautious. 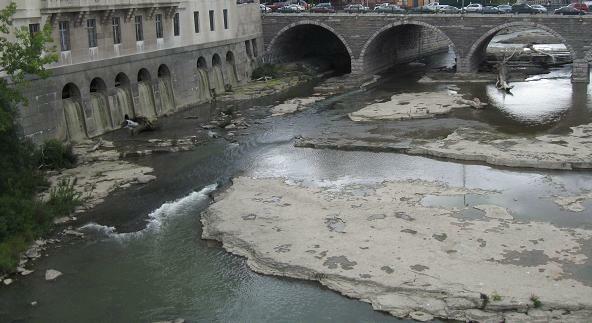 I wish I had known that I could walk the second level of the aqueduct bridge. The opposite photos, Main St. from Broad St., with other sights from the bridge, ending with the Court St. Bridge and I-490 behind it. 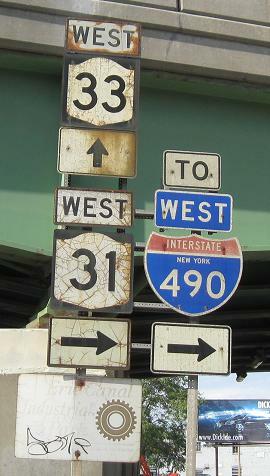 Broad St. WB (NY 31 WB) at South Ave. (NY 31 EB), and Court St. EB also at South Ave. That's economy of signs. 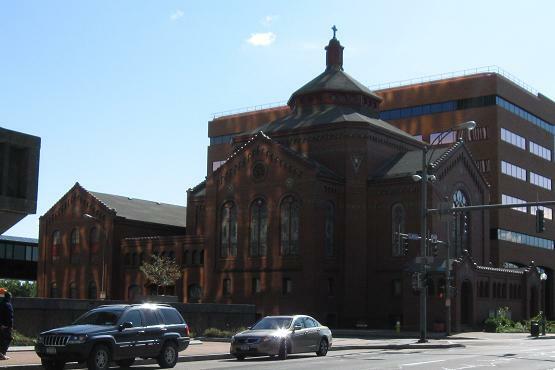 Turn the corner from Court St. onto South Ave. and you are greeted by a piece of history. 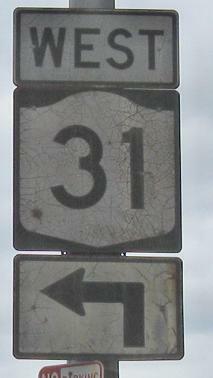 US 15 came up what's now NY 15, ending as the NY route still does at NY 31. 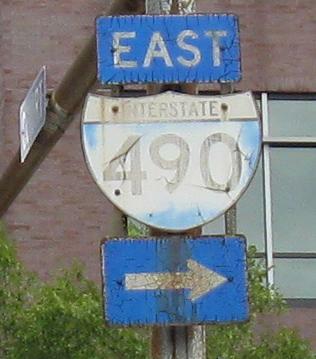 So back when it was the main north-south route instead of I-390, signs like this guided traffic from downtown to 15. 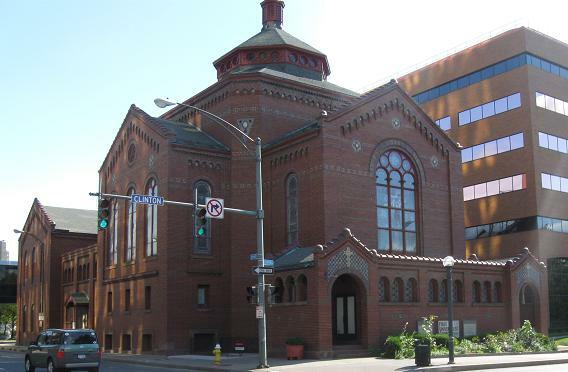 The First Universalist Church is a century old, relatively new for a church, but is deservingly already on the National Register of Historic Places. 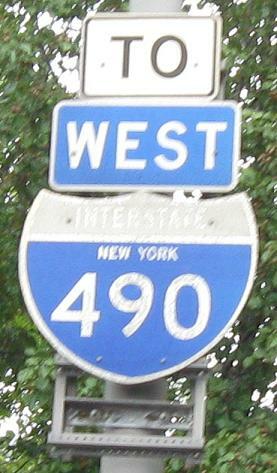 See it at the corner of Clinton Ave. (NY 31 NB) and Court St. 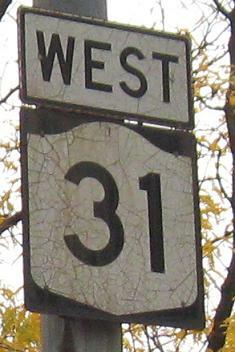 I think Woodbury Blvd. 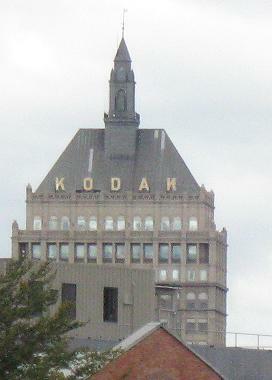 at Chestnut St., courtesy Doug Kerr. 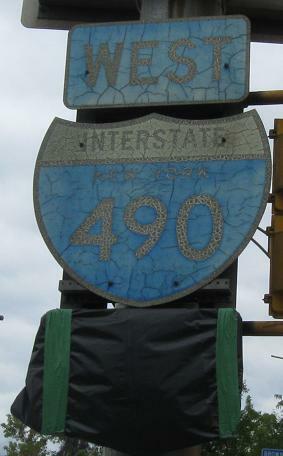 Most of the older Inner Loop shields have been replaced now. 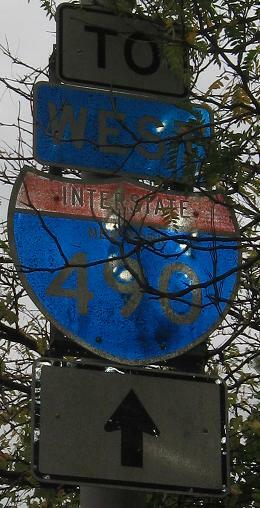 On the east side of the city; the second photo is WB from Winton Rd. 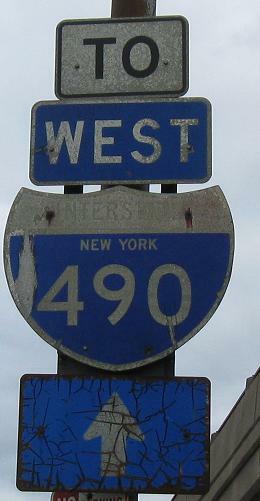 (the location of the shield atop this page).